Because we spend our days in the city, it's always nice to have an out-of-city experience! 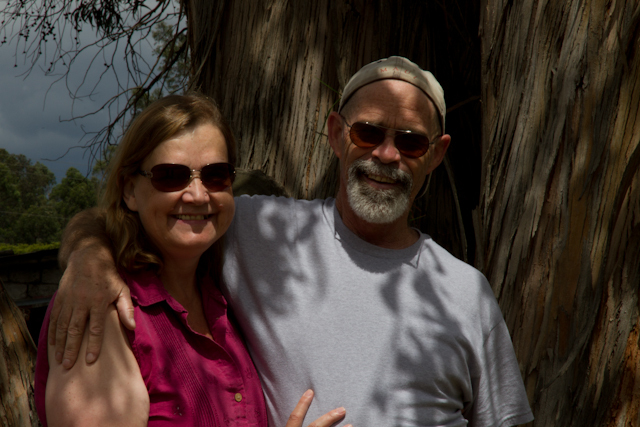 So, on Sunday, we walked from El Centro to Tres Puentes along the Yunancay River to meet up with Steve and Mary, creators of South of Zero and Expadorian Blogs. We ended up spending the day together as they took us on a Looooong walk through their neck of the woods. It was another beautiful warm and sunny day, and we had a fun and funny time (they enjoy laughing and joking around just like us) getting to know each other and seeing lots of new sites along the way. 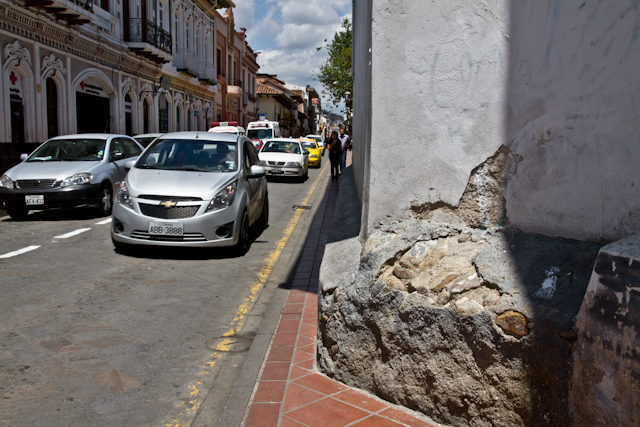 of course, I had my camera with me, and I was able to photograph new areas more locals of Cuenca. 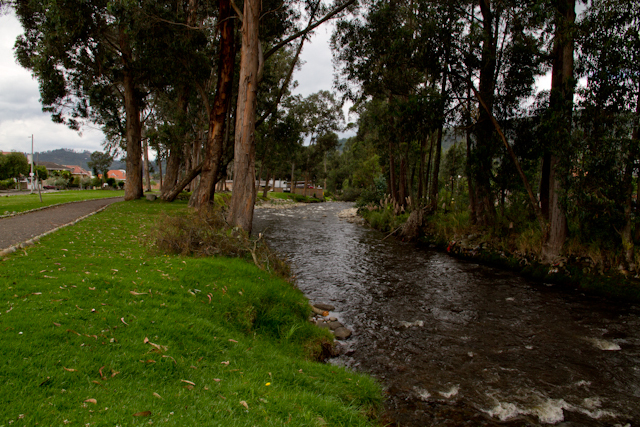 It was enjoyable capturing some of the scenic landmarks as well as photographing special Ecuadorian people we met along the way. One never knows what or whom they will encounter in a day, and for me, it's about the people we meet and the stories they graciously share. I love engaging the local people with my Spanish questions which they so willingly answer, letting me behind their curtain and into their humble lives. They also love to know about us, estranjeros (foreigners) - why we've come to Cuenca and what we think about their homeland - especially, where we're from and why we've left the United States for Cuenca, Ecuador. Mary and Steve from South of Zero - Ready to torture us on a LONG walk outside the city. It was an exceptionally warm and "blue sky" day - and we loved having them as our tour guides. 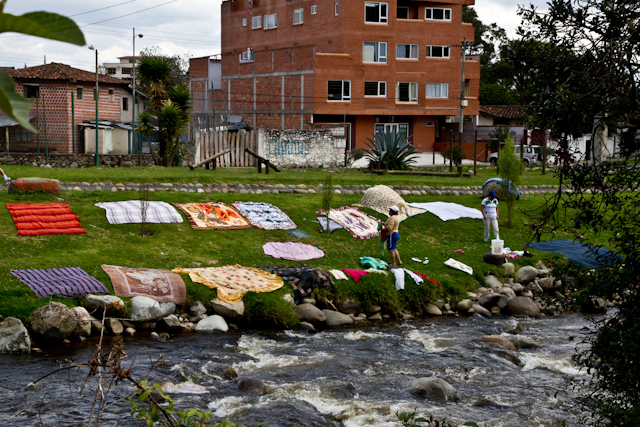 The weather was perfect today for the locals who do their laundry in the river and then lay them on the grassy slopes to dry (this is the Yunancay River). I'm always interested in the locals' lifestyle and how they live. 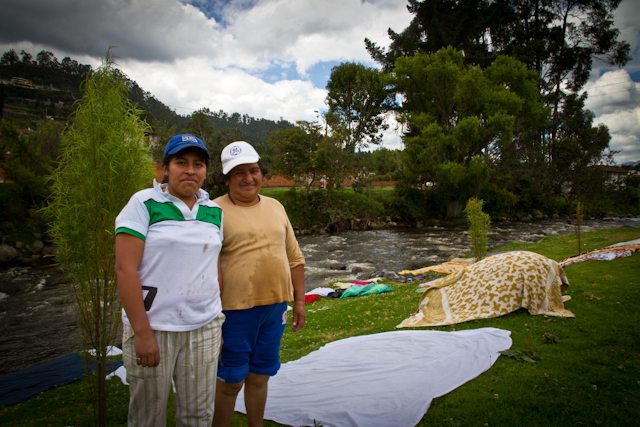 I had a friendly conversation with Joanna and Maria who told me that because they have little water at home (enough for cooking and bathing) they come to the river where they have plentiful water and can scrub their laundry on the rocks. 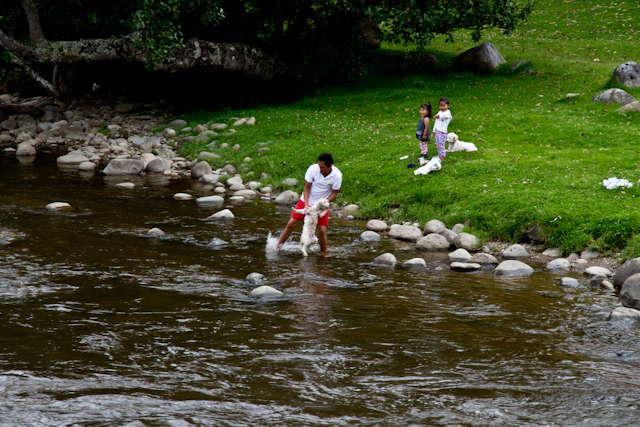 They shared that more people used to wash in the river, but the water is not as pure as it used to be. We also saw locals bathing their pets this warm and sunny afternoon. Do you think this dog is going to give in so easily? I think NOT! 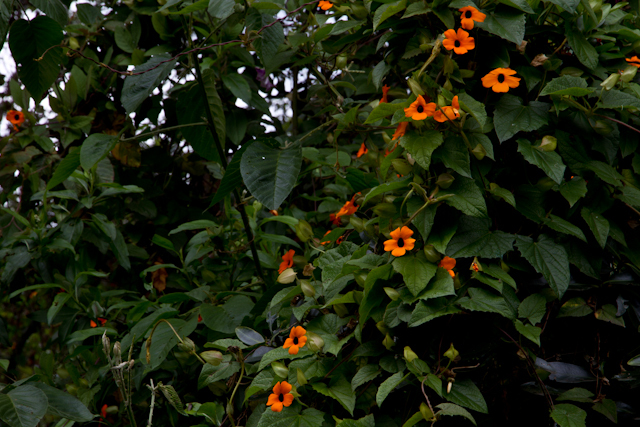 When we're out on our long Cuenca walks, I am always happy to see the beautiful foliage and colorful plants in January. Cuenca always presents this photographer with an incredible beauty! (photos above and below). 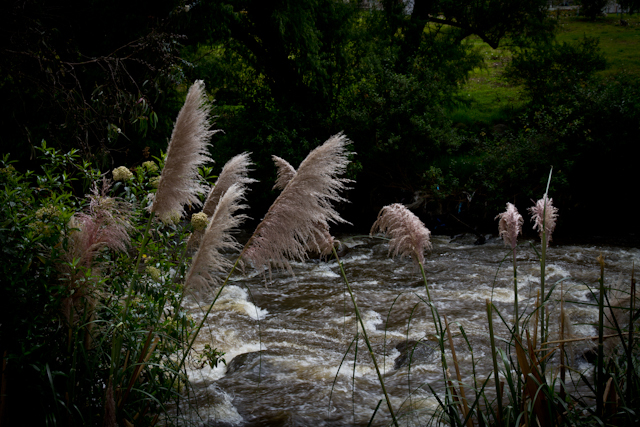 There are walking/running/bike paths along the beautiful rivers of Cuenca. 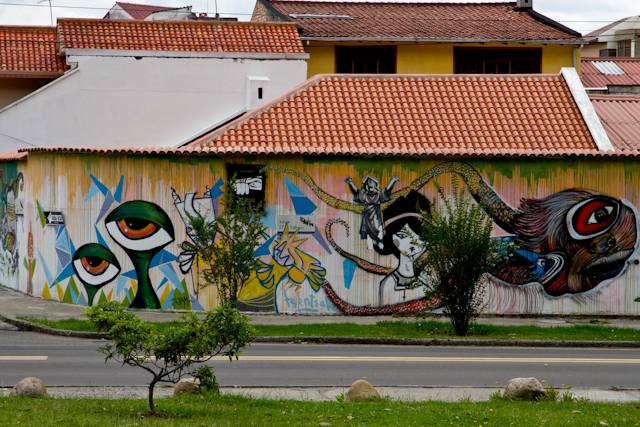 ......and artistically painted walls along the city streets. 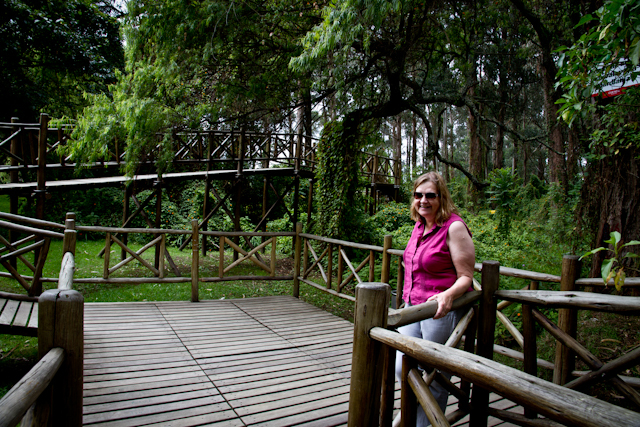 We visited Parque Paraiso (Huayna-Capac, Santa Ana de Los Cuatro Rios de Cuenca) , and strolled along their wooden walkways. Mary and Steve were very patient with this photographer who loves to stop (a lot!) and capture the beauty that adorns this city. More beautiful colorful flowers (photo below)! 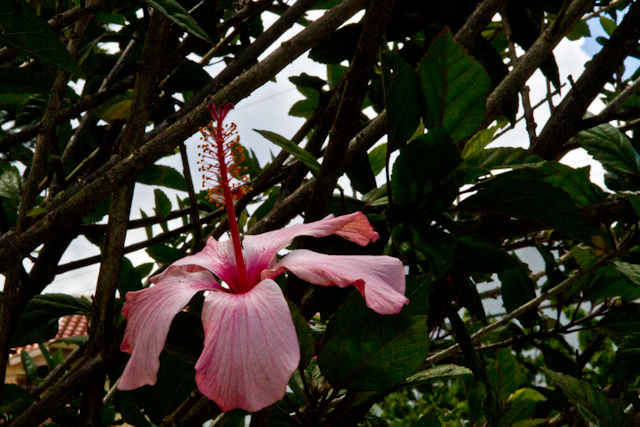 The weather here is perfect for us - not to hot or cold, no humidity, no mosquitoes, and flowering plants year round!!! I absolutely love this area along Calle De Las Herrerias. The colorful buildings and the magical sky makes this look like a painting! By now, these four walkers are tired, hungry, and thirsty, so we headed for La Casa De las Golosinas where they make the best Tamales in the world (Bo and I think!). Steve and Mary also agree that these Tamales ROCK! If you want cold beers to go with your Tamales, don't go on a Sunday! Sra. 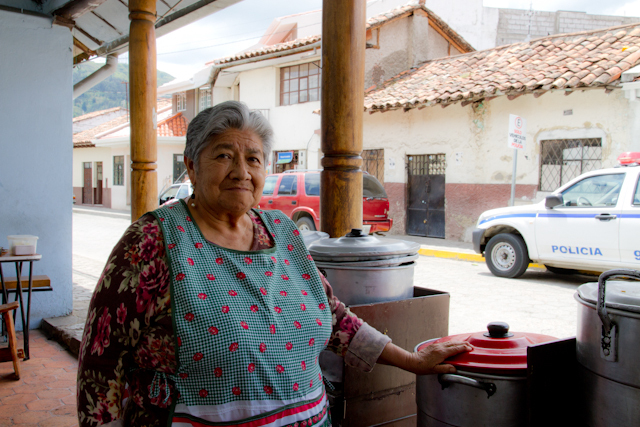 Zoila Quesada is the Tamale creator and owner of this tiny restaurant. She saw my camera and asked me if I would take her photo. Of course, I waited while she went to change her apron and freshen up before posing. We chatted in Spanish and she proudly began to share her success by sitting with us and showing us different articles and magazines where her story and photos of her delicious tamales have been featured. As hungry and thirsty as I was, while Bo, Steve and Mary feasted, I continued to chat with and photography Sra. Zoila and she was loving it! If you've never eaten here, YOU MUST! 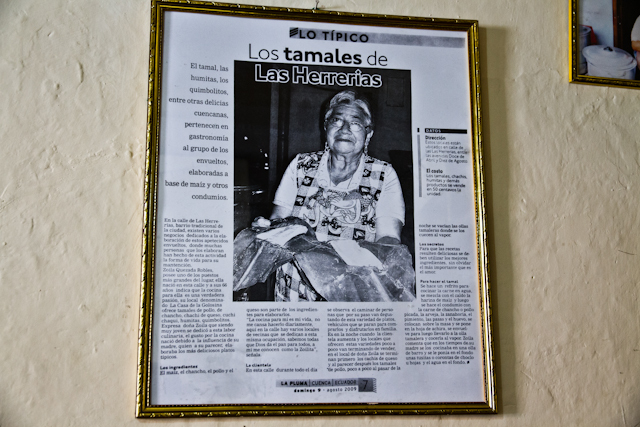 I told Sr. Zoila I was going to share her photos on my blog and let our readers know about her delicious tamales, which are only 60 cents each (Address: Calle Del Las Herrerias 2-10). She proudly smiled. I then told her I would love to see her production line and how she makes her prize tamales. She invited me back to let me behind the curtain and share in this wonderful experience! (More photos to come!!!) It really makes me happy when I meet the locals and am able to share in their humble lives and learn about their hardworking culture. The ICE COLD beers and crispy salty Platanos Chips were to die for!! .....and the Encebollado was perfectly seasoned and chock full of the most heavenly seafood (Tuna) and other surprise ingredients ($2.25 - I kid you not!!!). It was a fabulous way to end our day - sitting under the shaded tables outside, sharing funny stories about our lives and yucking it up together. Steve and Mary arrived one week before we did in December and are going through some of the same "Visa" challenges as we are. Now we can encourage each other and then go and celebrate when we finally accomplish receiving our visas and cedulas. Yes, it was another good day in Cuenca - making new friends and meeting more wonderful locals along the way. I can't wait to take Sra. 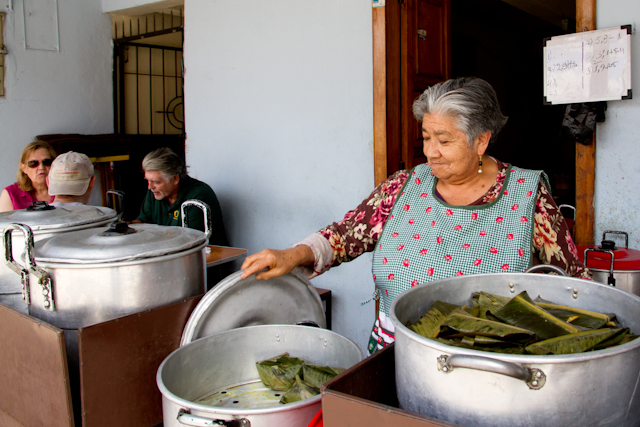 Zoila her photos and watch her make tamales!! 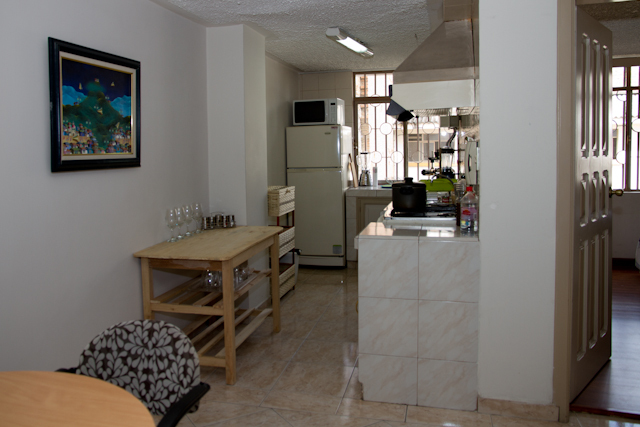 RENTING IN CUENCA ECUADOR - SEVEN WEEKS HERE AND STILL MOVING!! OUR 4TH MOVE - AND NOT OUR LAST, I'M SURE! 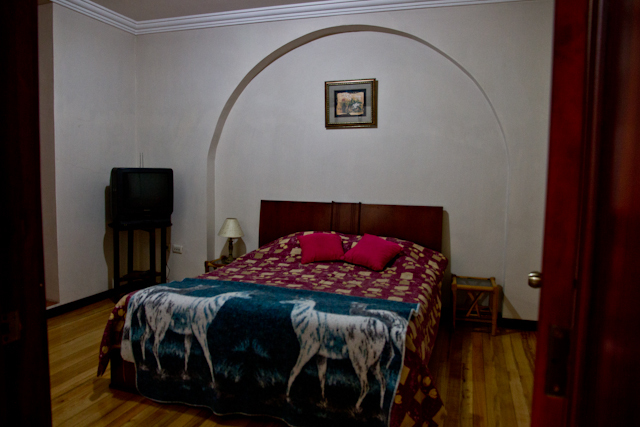 Hey, I'm not bragging that we've moved four times since arriving seven weeks ago to Cuenca. I would have loved it if we had found a temporary place to land and then had gone right into our "home away from home." Things don't usually work out that way for Bo and me. We always have some kind of adventure within the adventure - and moving has been a big part of this journey. I share all of this so that others don't arrive here with starry eyes thinking they're going to find that perfect place right away or a place like they left back home. Trust me - I know! Part of this moving has to do with finding a place in the heart of El Centro that works for us. Everyone has their personal likes and dislikes which will include their comfort of furnishings (furnished places here are not always comfortable or equipped), tolerable noise (that's another blog post about the "Ruido"), level of cleanliness (I'm a compulsive neat-freak), desirable location, type of accommodations (room, apartment, condo, house), and monthly affordability. I'm sure other things will come into play for others, but for us these were and continue to be the things that we are looking for when trying to find our "home" in Cuenca. If you've been following our journey, you'll remember reading that we landed in a temporary place that was brand new but, like I said, temporary - and we could have stayed there longer than we did, but we were both overly-anxious to find a place that felt more permanent and that was more affordable (that place was $165 weekly all-inclusive and our long-term rental budget was $500 monthly). 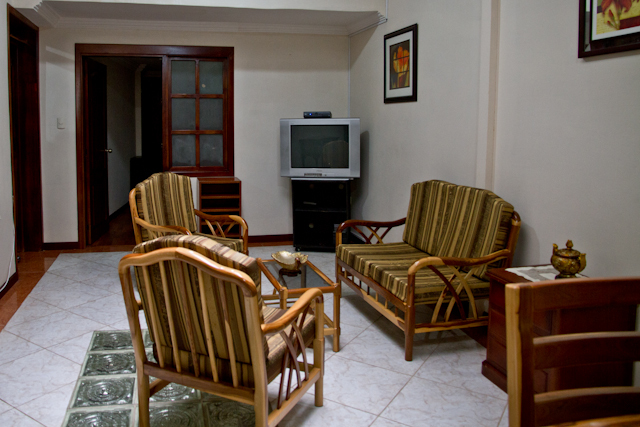 Within a week we moved to apartment #2 ($400 month-to-month, no deposit, all-inclusive) and immediately knew the first night there (read the blog!) we had to find a different place. That was the night I had my first melt-down in Ecuador (this implies I've had others - true confessions), and I cried buckets. We found Apartment #4 (the one we are nesting in now - $500 monthly, $500 refundable deposit, month-to-month and all-inclusive) a week after moving into apartment #2, but it would not be available until February 1st. So, we immediately signed up with our $500 deposit to hold it, and we resigned ourselves to stay in #2 for seven long weeks (I lied to myself!). Thankfully, another apartment (#3) became available in the same building as #4, so we signed up for that one and moved in right after New Years ($500 month-to-month and all-inclusive). It was a great transitional place for the month of January and we were so glad to be out of #2 three LONG weeks later! Nothing is by chance, and there are no mistakes. We make choices in life, and because of our moving choices, we've met more sweet people along the way, and we also now appreciate some of the little things that we would have taken for granted but that are now "gold" to us! We now have real china, stainless steel pots, a beautiful view, comfortable living room furniture, cupboard space for our food, a washer and soon-to-arrive dryer, and on and on. 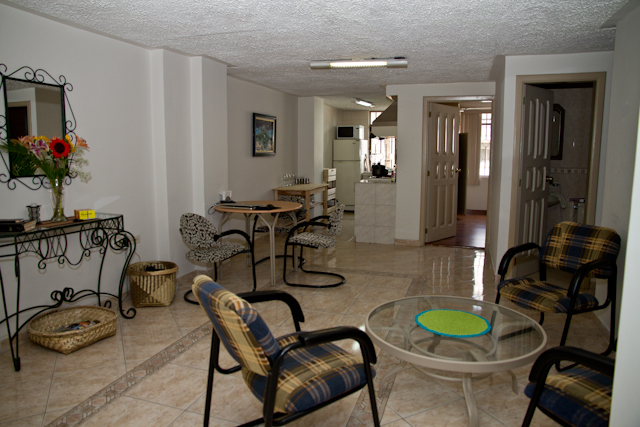 We love the location because it is in the very heart of El Centro and we can walk to everything. So, for now, we're living day-to-day and renting month-to-month, and we finally are a bit more settled into a place we feel we can stay at for another few months. Of course, we're always looking! So, if something more to our liking comes along, we'll definitely check it out. We continue to search every possibility, and it's very freeing living like this because of the option to up and go anytime. 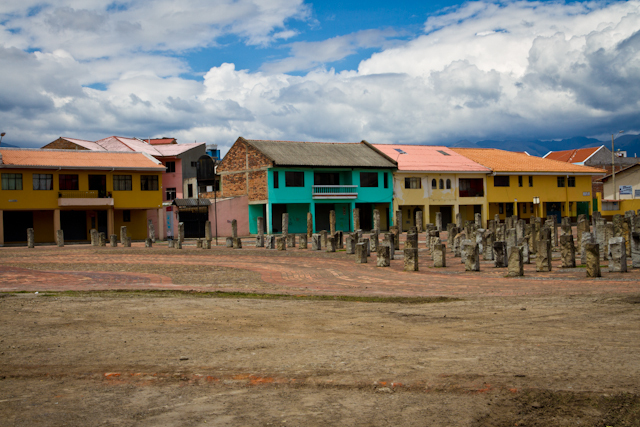 Unlike some, we came to Cuenca to live one day at a time and to see if it is truly for us. We are not looking to return to the States at this time. Every day when we are walking the streets of Cuenca in the warm sunshine, shopping at the open markets, meeting new and kind vendors and interesting people along the way, and living the unencumbered and simple lifestyle of Ecuador, we say, "What's not to love about living in Cuenca?" 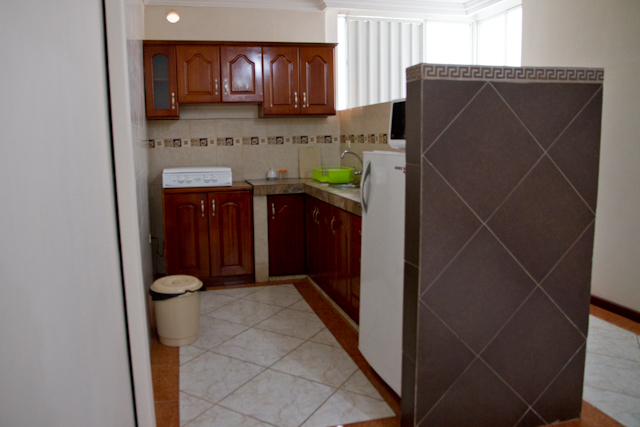 Apt #2 Kitchen - Quite small and a bit too cozy! The faucet poured (not leaked! 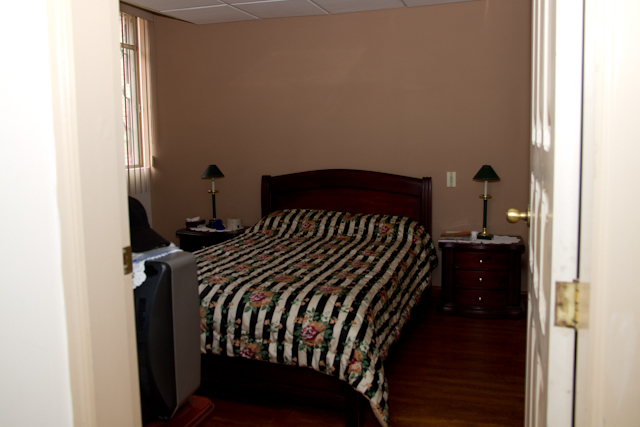 ), and I was told to put a picture in the top left corner to cover that hole in the wall! Obviously, that person does not have the gift of decorating!! HATED the plastic dishes and aluminum pots. Very poorly equipped! Apt #3 Kitchen - Loved the windows and light. No cupboards for food storage (good thing we cook mostly fresh!). We bought the unfinished table at the Rotary Market for some more counter space. Still small and a bit too cozy but better equipped with nicer dishes, glassware, and cookware. Apt #4 - Ahhh, much better! 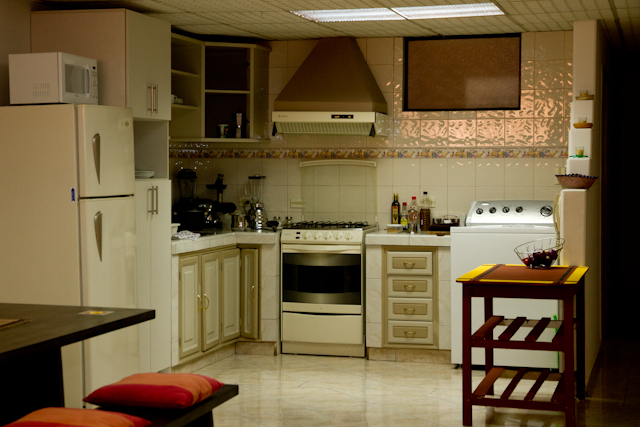 Kitchen is open and spacious, bright and fabulously equipped. Bo and I aren't bumping butts and we appreciate all the things we have here! No, it's not my colors nor my decor, but it's clean, comfortable, and has everything we need. The price is right! Apt #2 Living room - This was the most uncomfortable furniture EVER! My patio furniture back in Oregon was plush compared to this thin-cushioned rock hard flimsy set they pass on as living room furniture. 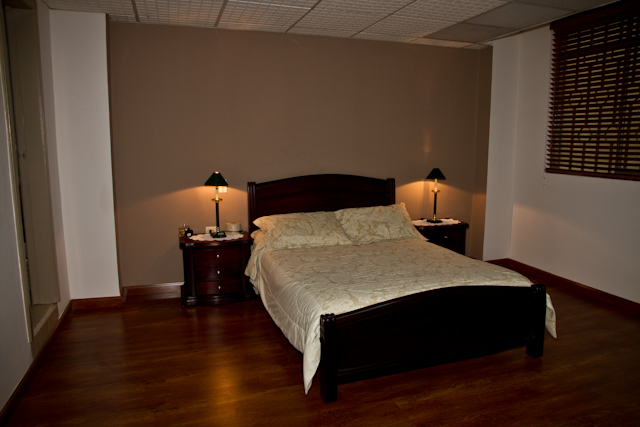 We ended up putting it in one of the three bedrooms, and moving a bed out here to lounge on. Hey, it worked! 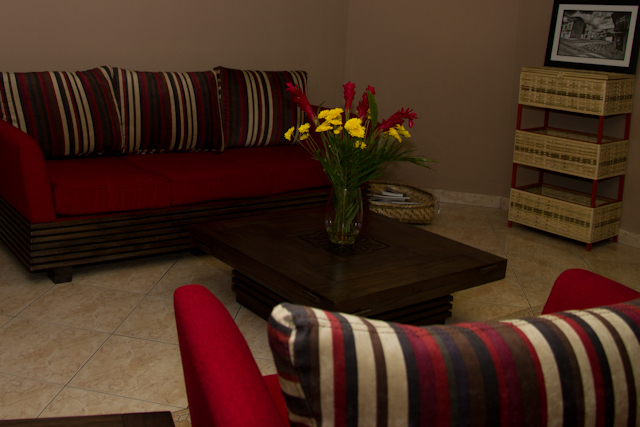 We could watch our two channels in English in comfort! Apt #3 Living Room - Now we're getting more comfortable, I think! Here we have a patio table and some actually pretty comfortable chairs for the living room (gotta love that plaid - and it goes so well with the dining room chairs - ya think? Notice there are only three chairs for each area - go figure! Who in the world came up with this decor???? However, after Apt #2, we were happy to be here for the Month of January until we transitioned to Apt #4, which we had a deposit on since December 15th! Apt #4 Living Room - Yes! Real furniture! And, very comfortable too. Bo's a big guy, and he now can sink into a chair here. There's also a big chair in the room-with-a-view where Bo sits and works on his computer. We are enjoying our 4th move and glad we did it! We won't be decorating beyond what's here though. It's another month-to-month landing pad, the price is right, and it's the best place since we've been here. That's a good thing! Wonderful view from our Window! This afternoon, we went over to our #3 apartment across the hallway and met a mother and son who just moved in. He is from Seattle, Washington, and his mother is from Poland. They expressed to us how thankful they are for this place and happy to be out of their last place (a very expensive condo outside the city and with lots of added fees)! They've been here 3 months, just got their visas, and are hoping to have their cedulas in one week. Theresa expressed that she and her son are here day-to-day with a desire to possibly relocate to the southern area of Ecuador and eventually have some land and a small farm. Such is life! People are arriving here with hopes and dreams for a new beginning and a new season of change and adventure. We're all journeying through this life of changes and "suddenlies", but each of us is making a different movie. It doesn't matter where one is. Bo and I just happen to be making our movie in Ecuador this season of our journey. To say one has to commit to Ecuador once they decide to move here or they will never make it is absolutely not our way of thinking! To make the most of each day, to learn to be in the now moment of life, to be open to change and new beginnings and taking the risk to journey there, and to embrace where we are seasonally and know it may not be forever is a freer and more peaceful way to live. If things don't work out, we move on! Today we're in Cuenca, and we'll be here and embrace the precious Ecuadorian people, their culture, their lifestyle, and all the surprises and "suddenlies" along the way. Only then will we have had a successful season in our "Ecuador" journey through life. Though a day may not always go smoothly or as we expect or hope it will, we are figuring it out along the way and taking responsibility for our part in the process. My beautiful $2 bouquet to brighten up our living room! This early evening, on the way home from the mercado, we stopped at the Flower Market, and a sweet flower vendor, Sra. 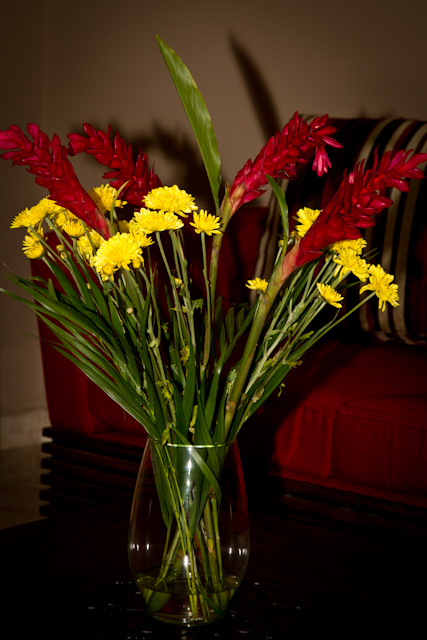 Anita, fixed me the most beautiful bouquet of yellow mums and unusual flame-red exotic flowers (not sure of the name), all for two-dollars! Now, a generous fillet of fresh Tuna from the mercado is marinating in Bo's garlic-ginger-lime sauce, and we're thankful to be spending a quiet evening in our 4th location! 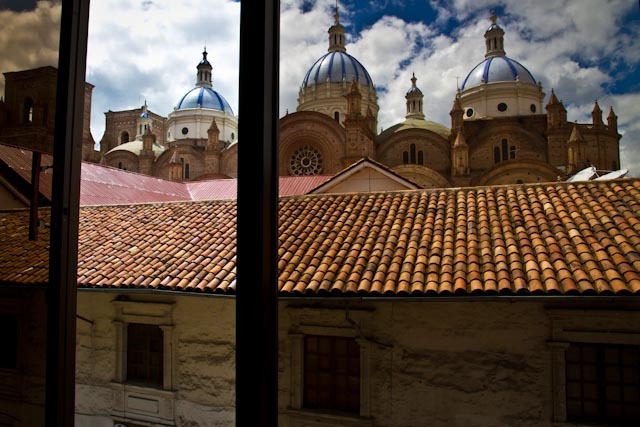 It's been another warm, sunny, and beautiful day in Cuenca! We’re not in Kansas anymore Toto! We have been in the process of getting our investment visa since the day we arrived here seven weeks ago. We landed with all the necessary documents apostilled. All we had to do (we thought) was to get the documents translated into Spanish and notarized here in Ecuador, open a bank account to transfer the necessary funds to get a CD as security for the investment visa and submit the paperwork to Immigration for the necessary approval and badda-boom badda-bing, we get our visa! Things began swimmingly as all our documents were in order and the solicitor who was helping us got them translated and notarized in the first week. Now all we had to do was open a bank account so we could deposit the money and get the CD. In America, this is a 15 minute interaction that gets you a cheap pen, a free cup of coffee and a handful of dusty candy. Not so in Cuenca! Outside of the (not) bank our solicitor told us that this must be a new regulation because in the past a Coopera CD was recognized as legitimate collateral for an investment visa. (Um, mixed messages here??) Now that it was apparent that this institution was not going to be able to help us with a CD, we queried our solicitor as to what bank would be best. Without any hesitation she said Banco Pichincha and gave us the name of a banker that would help us breeze through the process. Weary and frustrated from the day’s events we galumphed home and buried our sorrows in a plate of pasta. We arose the next morning from the ashes of the previous day’s disappointment with a renewed sense of purpose. Steeled with strong black coffee and the American “can do” attitude, we marched off to Banco Pichincha to set up our new account. When we arrived at the bank, we were informed that the person to whom we had been referred was not in and may not be back for hours but the other individual who did the same thing could help us. We obliged and entered her burrow. After going through the preliminaries she assured us that we had picked the right bank and she could open the account for us. All we needed were two pieces of ID and a form from Immigration and we’d be set to go. Needless to say, we weren’t terribly happy since no one had told us about this government form that we needed. As is the case in the US, when dealing with the government bureaucrats things can only go south from here. And they did!!! The Immigration office was on the other side of town about two miles away. Just far enough to warrant a taxi ride. Darn! More time and expense. So off we went, Linda trying to keep my spirits up with pithy aphorisms like, “Remember, this is Ecuador not the US.” We arrived at Immigration just in time for the customary Ecuadorian LONG lunch break. We were informed by a rather dolorous-looking guard that the person who would service us was out for lunch and would return in an hour. 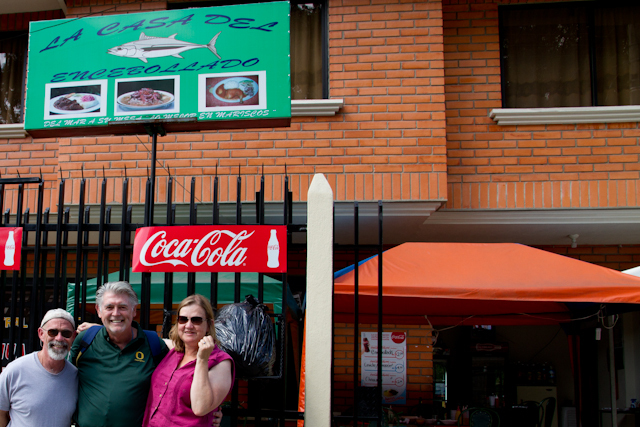 Resigned to the fact that yet another day was shot, we went in search of the perfect “almuerzo" ourselves. But, alas, she was either rehearsing the newest step in the civil servant shuffle or suffering from the incipient manifestations of St Vitus’s Dance as she executed an haute ecole that would make a Lipizzaner green with envy on into a vacant cubicle not two feet from us where she plunked herself down and ceremoniously began a phone conversation. Since her nickering was in Spanish, I was uncertain as to what she was saying, but I did manage to hear the phrase “los dados (to dice)..... papa.” I wasn’t clear as to whether she said el papa (the Pope) or la papa (the potato), so she was either instructing someone on how to prepare her favorite potato recipe or she was going to chop the Pope into little pieces. At this point, none of my loving wife’s words of comfort could soothe the savage beast within me. I decided that it was best for all involved (including our Ecuadorian Ambassador who would have to clean up this international embarrassment if I tarried any longer) that I retreat, regroup and retool. We called our solicitor and informed her of the quandary in which we found ourselves. She assured us that she could get things handled and asked that we meet her next week at the Banco Pichincha branch just a few blocks from Immigration. The following week (we are now in the second week of trying to open a simple bank account) we trudged a mile and half walk to meet our solicitor at a another branch office of Banco Pichincha. After roughly an hour of waiting, discussing, waiting again, discussing again, it was determined that only our solicitor’s contact at the first branch at which we started this whole process could handle opening our account. So off we went!! Another cab ride back to the branch office that was only six blocks from our house and another hour wait, and we finally got in to see our contact. After much bantering back and forth between our solicitor and her contact it was determined that we did indeed need the form from Immigration, but because she had sent so many people to the bank to open accounts there they would temporarily waive this requirement until we actually got our visa (by putting a piece of paper in our bank account file stating the form was missing!). At that point we could go to Immigration, produce our visa, get the form and deliver it back to the bank and they would insert it into our file. We took the paperwork with us realizing that we still had the laborious process of filling them out later. Still needed were two notarized color copies of our passport, a second color ID (not notarized), a utility bill from the address at which we lived and a letter of recommendation from someone who had an account at the bank. We left the bank, got copies made and walked eight blocks to get them notarized (More $$). Another hour passed and finally we had our notarized papers. Now all that was left was to fill out the forms, get a utility bill and secure a letter of recommendation. Neither of these were small things. We were in a country where we do not know anyone and living in an apartment where we paid no utilities, hence no utility bill. The next few days we asked the few people we did know about getting a letter of recommendation, but none of them had an account with Banco Pichincha. 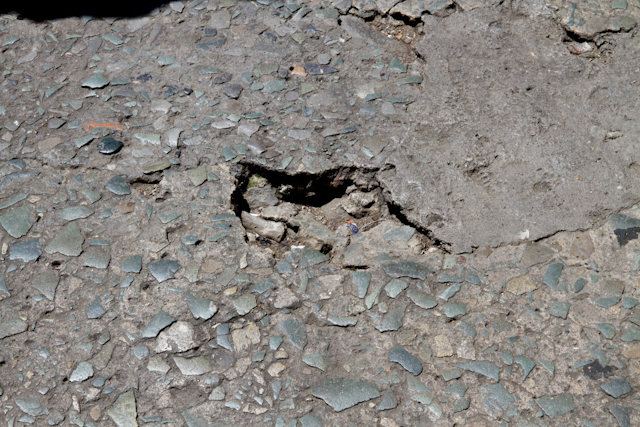 We emailed our solicitor and asked if she could help. One hour later an email showed up informing us that she had asked around and no one could help us. We advertised on the local expat website, GringoTree, stating specifically our situation to see if anyone would help us with a letter of recommendation. We did get some positive helpful responses and also lots of free advice. “Use a different bank” “Pay a lawyer”. “Get a different kind of visa”. Blah, blah, blah. The next day we met with her, got our letter of recommendation and took it along with all the other papers to see our contact at the bank, overjoyed that we were finally going to open our account after three weeks. Joy turned to sorrow when we realized that we had to get our Oregon wiring documents notarized. So off we went to try to accomplish yet another step required by the bank. We had to go home, access our Oregon bank account, copy the statement and burn it onto a hard drive to take to get printed. The print shop could not open it (don't ask me why), so no copies. Finally, I just sent it off via email to our bank contact with a note that I would be down in one hour to answer any questions and pick up my receipt. Another hour wait in the office to see him and finally the account was opened! We are now waiting for the check to clear so we can set up the CD (approximately another eight business days). Start to finish, we are looking at almost seven weeks to set up a bank account and get money into it. We’re not in Kansas anymore Toto!!! Will keep you posted. Some days are diamonds and some days are dust (literally)! The ordeal at the bank left me disliking Ecuador and everyone in it. It seemed like every blast on the tinny horns of those smoke belching puny cars bypassed my ears and went right into my soul. On the way home from the bank as we passed what generously could be called a feed store, the proprietress was cleaning out a cage full of dried chicken guano that had turned to dust and managed to blow it right in our faces. I was ready to pack my bags and get the first flight back to the States at this point. Linda was able to calm me down and we decided that it was best to simply head home and relax. which we did for the lion’s share of the day. All day long we kept hearing music and loudspeakers blaring away, but did not give much thought to the loci of this “ruido”. Having been cooped up much of the day, we decide after dinner that it might be a good idea to go for an evening walk. As we slowly strolled through Parque Calderon near our apartment we noticed an ever- increasing swarm of people gathering along the sides of the streets. Additionally, a number of streets were cordoned off. We figured that it was yet another of the multitudinous parades that Cuenca has and decided that we should belly up to the curb and see what this one would have to offer. In the distance we could hear the same music and loudspeaker we had been hearing all day. Suddenly a stream of cars honking their horns appeared filled with jubilant votaries of one of the political parties of Ecuador. Flags were waving, cars were honking, young adults were squealing and police on motorcycles with sirens blaring were clearing both sides of the street. There truly was magic in the air! A large truck, the kind they tote vegetables on, appeared and lo and behold standing atop of it surrounded by a bevy of jubilarians was Raphael Correa, El Presidente de Ecuador. Not five feet from us was El Hefe himself! 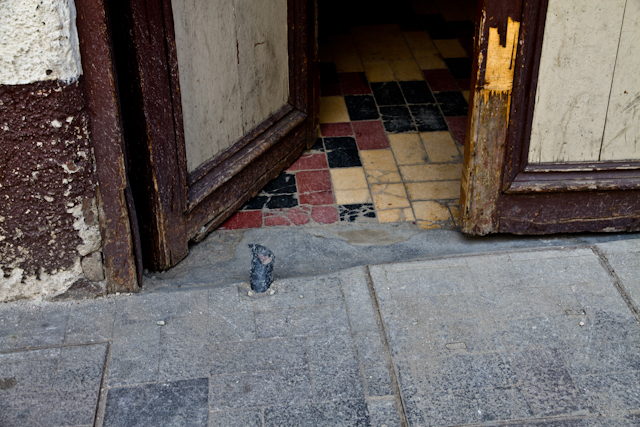 Apparently he had heard about my troubles with the bank and he had come to Cuenca to personally expedite the process. NOT!!! Both Linda and I were amazed at the lack of security surrounding him and the incredible accessibility the people had to him. No secret service, no sweep of the area, no security of any kind really. Just the leader of Ecuador surrounded by the people who elected him. We lingered for awhile amidst the President's cheering fans as he delivered his promises to the devoted crowd through the blaring loudspeaker, and after he passed by and the excitement was over we headed home. As we neared the entrance of our apartment we decided that we would go get an ice cream. Our friend Senor Diaz was closing up his little shoe shine shop, ready to crawl into his kiosk home for the evening, so we stopped and chatted briefly with him. We told him we were on our way to get an “helado” and asked if he would like one. "Seguro," he replied. What kind we asked? “Whatever you bring me will be fine and appreciated,” was his sweet reply. When we returned we spent a lovely time chatting with Senor Diaz and lapping our ice creams. As we turned to leave he thanked us and then asked if we could do him a favor. He wanted to know if we would give him two dollars so he could go visit his wife who has been ill and confined to a care facility. His inquiry was so sweet and loving. We pressed the money into his palm with the words “Que Dios te bendigo” (that God would bless you). We said our adieus and parted for the evening. What had started out as a day of dust (literally) ended as one of diamonds. 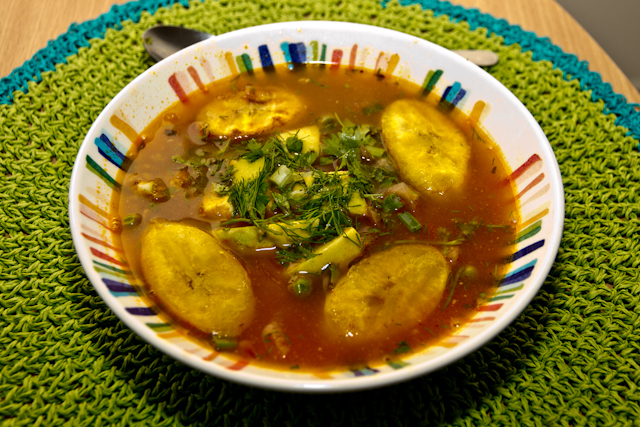 COOKING IN ECUADOR - BONE BROTH SOUP - THE RECIPE FOR "BO'S BODACIOUS BONE BROTH SOUP"
This soup starts with a rich bone broth. For the sake of brevity and space, please go to the following website http://bodyecology.com/articles/bone-broth#.UQB-uuhjFZ1 to learn how to make this delicious bone broth and discover more about the nutritional aspects of it as well. In a medium sized saucepan heat PVOO and cook crushed garlic cloves and onions on medium high heat until translucent. 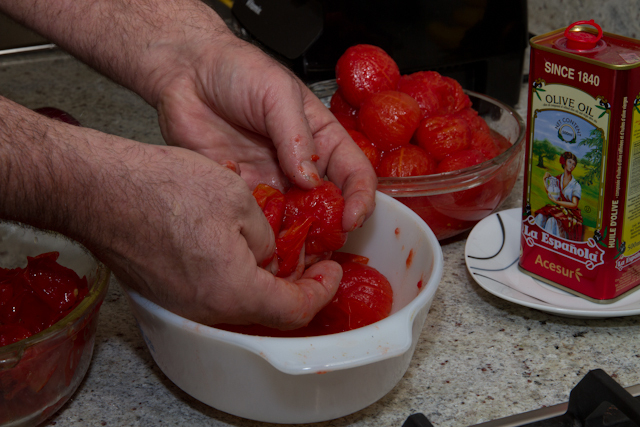 Lower heat and add tomato paste and salt to taste. Stir ingredients until well mixed. Add ½ cup of beef broth and stir well. Set aside and prepare other ingredients. You now have starter for remaining soup. In ½ cup of broth, bring peas to boiling for 2-3 minutes. Cut ends off and peel platano. 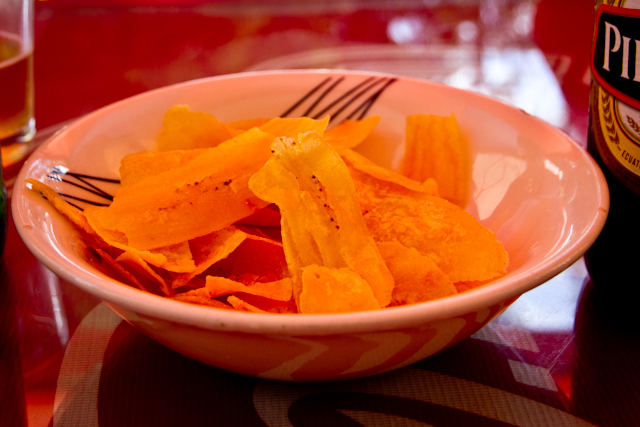 Cut platano in one inch thick slices on the diagonal. In a frying pan melt butter and/or coconut oil on medium heat. Place platano in pan, cover and cook for roughly 5 minutes before turning. Platano should just be turning brown. If you desire them darker cook slightly longer. Soak rice over night in water. This makes the rice easier to digest. Empty water and use bone broth to cook. Always use 2 cups of liquid to every cup of rice. Bring rice and liquid to boil being sure to stir occasionally. Let rice cook for 1 minute at boil then reduce heat to medium low and cook for 30 minutes. Check rice for tenderness and if necessary add additional liquid. Depending on altitude (I am cooking at 8,300 feet) rice could take up to 1 hour to cook. If using beans:Soak beans over night in water. This makes the beans easier to digest. Empty water and use bone broth to cook. Cover beans completely. Cook on medium for at least 1-2 hours checking for tenderness and liquid level every 15-20 minutes. When ready to serve, add 6 cups of broth to soup starter and heat to desired level. If all other ingredients are room temperature, I bring soup to vigorous boil to help maintain heat level when serving soup. Into serving bowls place equal amounts of peas, rice and/or beans and ladle hot soup over top. Place 3-4 platanos in each bowl. Squeeze juice of ½ of small lime (about a half tsp). Top with avocados, chopped green onion and cilantro and serve. For those of us who enjoy a little heat you could add a splash of Tabasco Sauce. how it turned out or if you added your own twist to it. ENJOY!!!! Jagged pipe sticking out of sidewalk right in the path of a doorway! 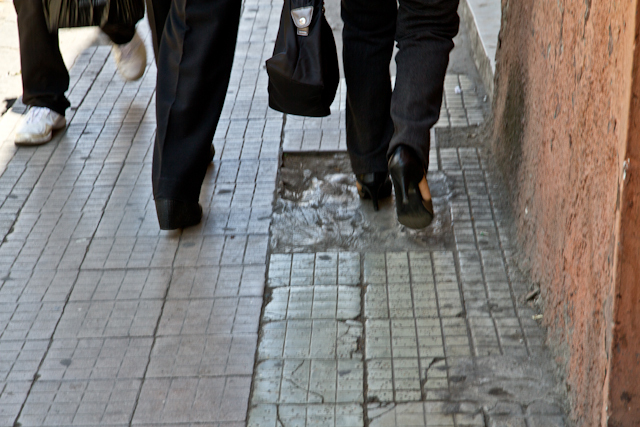 In the USA, the sidewalks of El Centro would be a lawsuit waiting to happen! 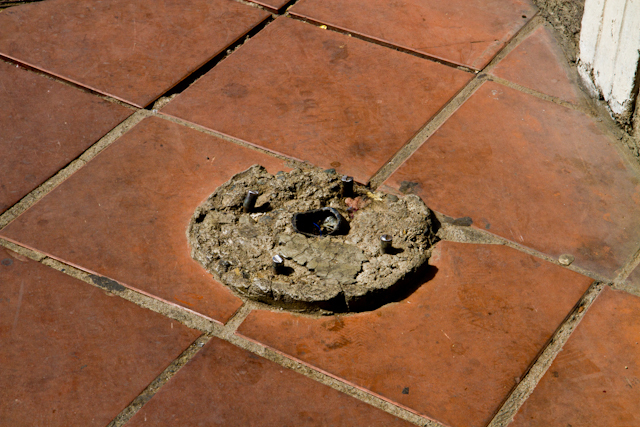 No words can help to visually describe the unexpected obstacles and hazardous objects protruding along the sidewalks and streets. One has to come here and experience it for themselves. It's a miracle I haven't yet broken a leg or taken a nose dive, and only because of Bo continually watching out for me and catching me many times. Even when I'm paying attention, I find myself tripping along, catching myself from hitting the bricks, and I'm constantly amazed at how clumsy and unsteady I feel in my daily walking treks through the city. I've learned to wear the proper shoes for long walks. I've learned to be more cautious about paying attention when I'm sight-seeing along the way. A friend gave me some good advice. She says she stops when she wants to look at something (that's because she learned this after breaking her foot her first week here - ouch!) Bo and I are continually amazed and have to laugh when we see yet another crazy object to add to the many we've become used to and cautious of. I had to take an afternoon and go out and photograph what I'm talking about here. 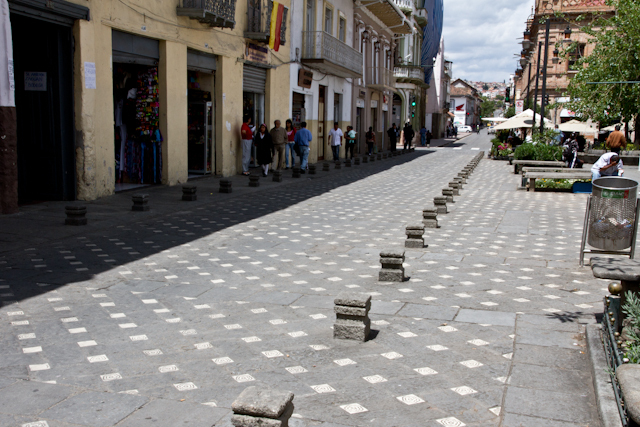 In all my researching to learn about Cuenca before Bo and I came here, I never read anything nor saw any photos of the condition of the historic streets and sidewalks. Therefore, I've focused on taking closeups so someone never having been here can be forewarned. When you first walk these streets, keep your eyes ahead and continually looking down before you take each step. Do not look up without stopping! Pay attention!! They don't do lawsuits here - so you won't be collecting from the city if you take a nose dive and injure yourself. I love that there are no city ordinances for every little thing, no permits, warning signs, rules and regulations that make one feel like they have little freedom or that give them an open option to sue. 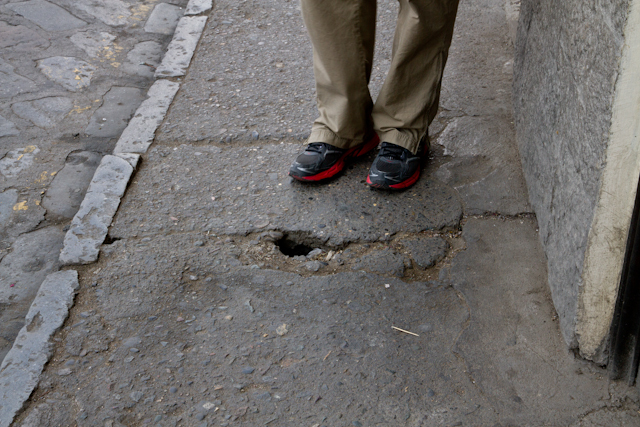 Even though there are death traps along the streets of El Centro, there is a freedom in our steps knowing that we are responsible, and that's a good thing! 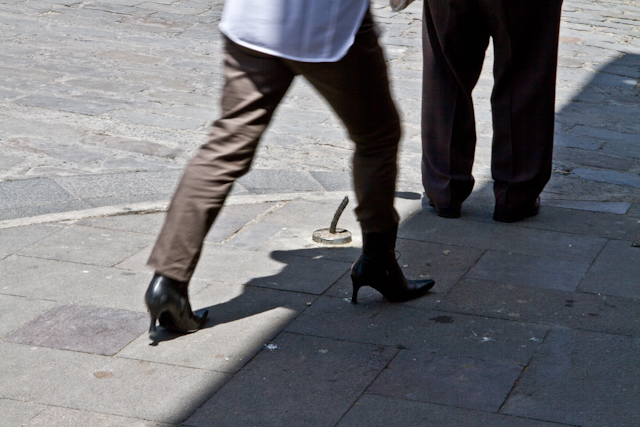 Ecuadorian women love their tacones altos (high heels)! These are nothing compared to some of the heels I've seen click clacking down the hazardous streets. 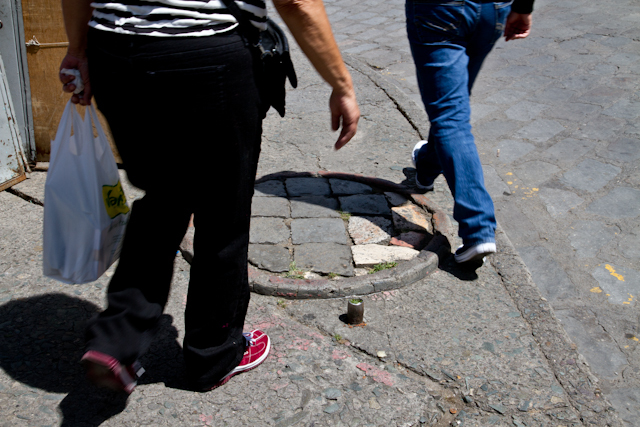 Well-dressed women fly by the pipes and holes and uneven sidewalks. Not me, I'm in my athletic shoes! I'll be walking along an even-tiled walkway and all of a sudden! This little girl is looking down and paying attention! Double Whammy - A pipe and a whatever that is! Athletic shoes, business shoes, and more tacones altos rushing through the surprise streets of Cuenca. These two rows of concrete posts are to keep the traffic in line - I think! I saw a gentleman actually trip over one of these. He did, however, catch himself. 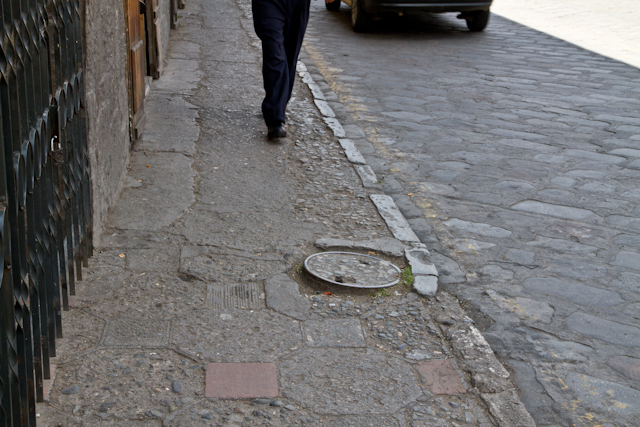 Sidewalks will suddenly narrow (PHOTOS above and below), and some will have to pass by via the street. Just hope a bus, taxi or car doesn't come too close to the curb! I hope this pedestrian isn't looking up! 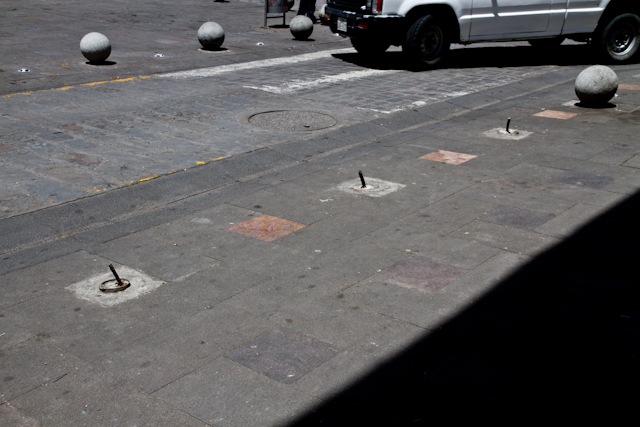 The balls (whatever they're supposed to be for) are no longer in these three places, BUT, the protruding spikes are. Did they leave them there for decoration? I think NOT! 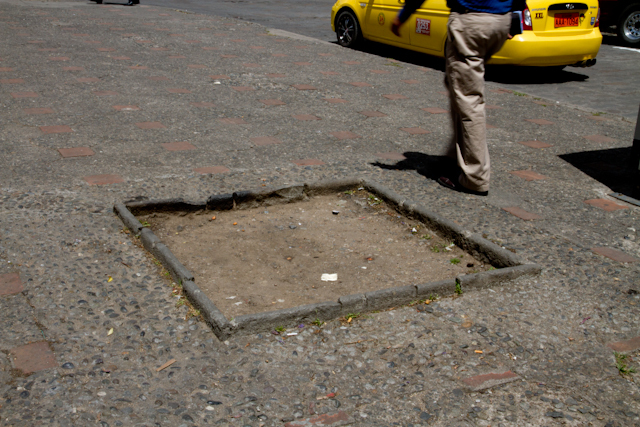 (PHOTO above and below) Holes like this are everywhere on the street of El Centro. If you're not wearing athletic shoes or flat-sole shoes, CUIDADO! This walker has enough sidewalk area to go around. There used to be a tree growing here, surrounded by fencing, but it must have died and they forgot to fill in the hole and level it out - again I think! Okay, that's my story on the sidewalks of El Centro - and my message to those coming here for the first time (or second, or third.....). Don't say I didn't warn you!!! 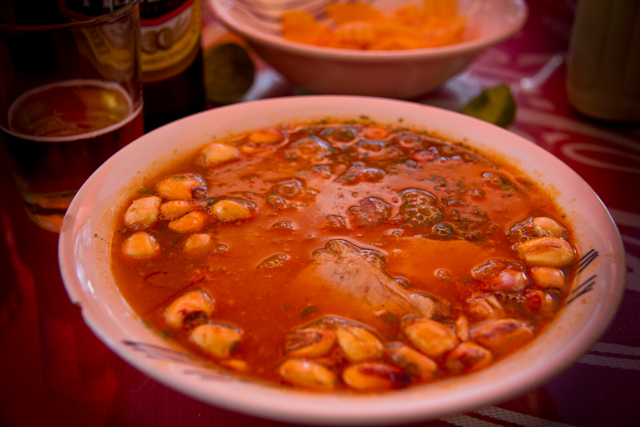 FOOD IN CUENCA - LIVE TO EAT or EAT TO LIVE! Food is a big deal! Most people "live to eat" instead of "eat to live." The obesity statistics in the USA is a reflection of most people "living to eat." The thought of being in a country somewhere else where one cannot find their favorite fast food joint or processed packaged or bottled food would be one main reason someone might not move from their country - because food rules in their life. Some people could never imagine not having a store that has their produce already washed, polished (with poisoning shiny wax) and looking perfect in a styrofoam dish with plastic wrap around it or a big plastic container. Their meat must be bloody red, and it must be tender, therefore, from a hormone-injected corn-fed animal, certainly not a grass-fed organic one. Besides, that would be too expensive! And many people like NOT cooking. It's too much work and takes too much time! You have to plan a meal, go out and buy the ingredients, come home and prepare the ingredients, then put it all together and cook or bake it. That takes time! Most people truly don't have time. They're working and running around trying to fit in a million things in their day, especially if they have families, and so it's a lot easier to eat out at a restaurant (family-style of course) or grab something at that drive-up window. Hey, let's not forget Costco! They have great, inexpensive, delicious "just pop it in the oven" pre-packaged (with the beautiful finished food photo on the package) meals for that in-a-hurry, no-time-to-cook family. Sadly, I could go on and on - and not being able to read most of the names in the list of 25 or more ingredients that go into those foods is enough to warn someone not to even go near that food product. Hey, but I digress. 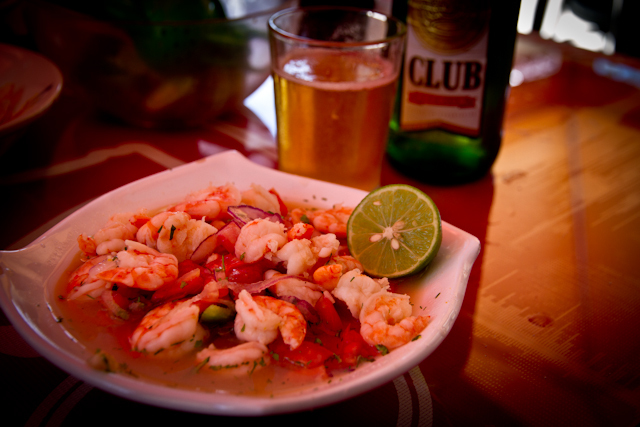 One question and subject that really stood out for me when researching living in Ecuador was FOOD! Food is a big deal! The main bulk of the questions were not, "Can you get fresh organic fruits and vegetables there?" but more like, "How difficult is it to find Jiffy Peanut Butter or such-and-such favorite spices, or beer, or wine, or blah, blah, blah, and on and on and on?" I don't have enough room to list the different name-brands that so many people who were planning the big plunge were concerned about when it came to food. Hey, I get it! There are things I miss that weren't particularly good for me (or Bo), but being here has changed our lives once again. We were already on the path of healthier eating back home. And when we arrived here, we took a bit of a dive downward, eating lots of PIG (Chancho) - which we love! Also, exploring different restaurants is the first thing we do when we arrive in a new area on vacation, so we were eating out alot! Well, for us, and again this is our life and how we do it, eating healthy and wholesome is important. Yes, we enjoy unhealthy foods, and sometimes a little too much. Yet, here in Cuenca, we have purposed to find places locally where we can buy our wholesome produce and meats, cook wholesome meals, and stay away from processed packaged foods. In our seven weeks here, we've been to the Super-Maxi about four times. Please know I'm not condemning anyone who shops there. Super-Maxi is like going to Albertson's or Safeway. Back home, we loved shopping mostly at Trader Joe's and Market of Choice. We didn't have the amazing Mercados that we have here. Yes, we had a Saturday Market, and we could go to the local farms. But, we didn't! We lived the busy full life of working 40 hours plus (that includes all the work around our country acre), and it was easier to be healthy by going to the local stores and grabbing the wholesome ingredients we needed to fix our meals at home. All this to say what? Well, I LOVE this part of our life here - the FOOD! I LOVE having a husband who enjoys cooking. We both are (brag brag brag) amazing cooks. We can make some killer meals between the two of us. Yet, here, daily we buy fresh produce and sometimes meat (it's not the main ingredient) - and make amazing wholesome meals at home. We can buy fresh daily, so there is little waste. Another reason why we love living in the heart of El Centro! The food we buy is not packaged (only brown rice and packaged beans if we can't find them locally). The produce needs to be washed and cut and made ready for the meals. The eggs are sold individually - not in egg cartons - so we carry them home in a plastic "bolsa" (bag), hoping we don't trip on the pipes and holes and uneven sidewalks and streets before we get them safely home. There are vendors selling bottles of whole unpasteurized, straight from the goat or cow REAL bottles of milk. An entire aisle at the market (10 De Augusto) upstairs is dedicated to herbal plants and medicinal concoctions for the body's healing and health. It's a timeless journey going down that aisle, and the smells are addictive and the beautiful huge bundles of herbs are too unusual to identify. There is no way to describe the difference in shopping in a city that is bringing in produce in such abundance daily, and it is a joy knowing that we have such a daily selection of FRESH and FARMED and UNPACKAGED Foods. Someone wrote that if you come here all you'll find is white rice, bland foods, and you'd better bring your favorite STUFF or you'll be without. Yes, this is probably true for anyone who is unable to use there imagination and who doesn't want to learn Ecuador's different fruits and vegetables, how to fix them and who is afraid to try new foods. it will be difficult for someone who is not willing to get out of their box and truly experience and live in this culture and country. It will not be the US or any other place one is coming from. It WILL be Ecuador! You will have to begin to enter the "tienditas" and search and ask (Oh yeah, better know some Spanish or be good at sign language), and I guarantee you, your choices, cooking, eating, and even weight and health will change - all for the good. Or, you can choose to bring your USA lifestyle here, never experience the food opportunities before you, and continue to carry in or ship in those things you can't live without. We, however (again, it's how we chose and continue to choose to do it) have purposed to continue to explore and discover and do without whatever we can't find. And, we're finding we're eating healthier and learning to cook with less spices and condiments, yet in a new and delicious wholesome way. Yes, we're loving the FOOD in Ecuador. .....and voila!! 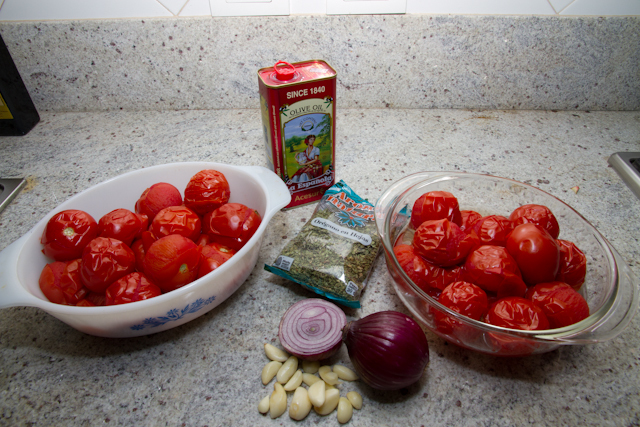 A delicious, no-cook (pot is used because we only had a couple of bowls) thick wholesome tomato product for soups, sauces, etc. 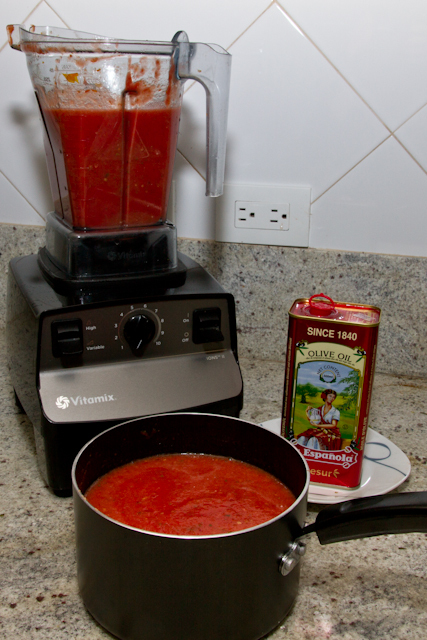 For $2 we made the equivilant of twelve 8-ounce cans of tomato sauce!! 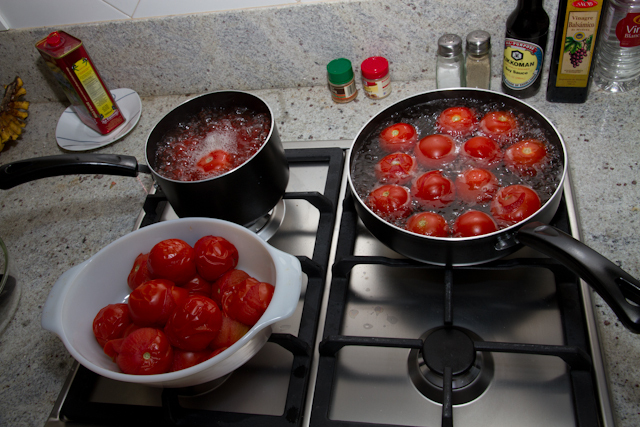 You can also make this without peeling the tomatoes, but you have to mix it up longer to dissolve the skins, and the sauce isn't as thick. This Beef Bone Broth was made for less then 50 cents a serving. Beef Bone Broth is one of the healthiest "caldo" you can make! Read this article (one of the many you can find on-line - I am not promoting this website except for this fabulous informative article) to find out the health benefits of this amazing broth. Let us know if you want Bo's delicious healthy soup recipe. 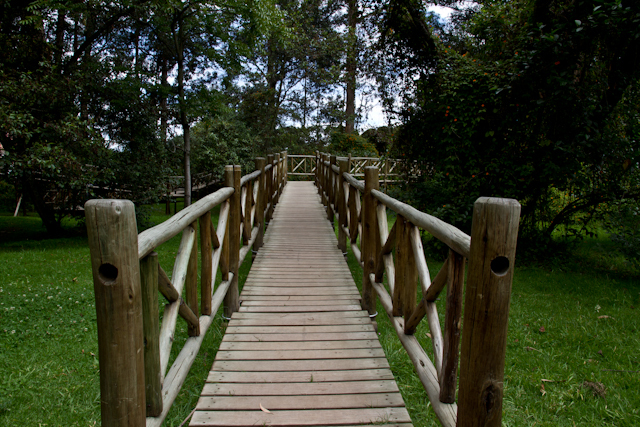 LIVING IN CUENCA ECUADOR - LOVE IT or LEAVE IT!